It was sort of a boring week...not much happening. I spent a day getting my proposals for the next issue of Cast On ready. One of the lessons is on pleats so I am proposing a pleated cardigan/jacket. I'm also doing the design for the lesson which will be a pleated baby dress. We generally do a pillow as the project but that really doesn't work for the lesson. I spent another day getting my handouts ready for the conference in Manchester. There will be a "Masters Day" the day before the conference opens. Registration has been very strong. We decided to open it up for another 10 students. The format will be slightly different this year, based on our experiences last year. TKGA is taking care of the handouts and wanted them this week. Instructors for regular courses have to provide their own handouts. We can ship them to the location rather than haul them which is what I am doing. I generally put things off until the very last minute but I have a deadline which forces me to get organized. I'm teaching four classes. I will be gone several days next week. I have to go to Zanesville for the selection meeting and have decided to take a trip up to Cleveland to visit the Rock and Roll Hall of Fame. When we drove up to Michigan for the Retreat we stopped in Ann Arbor to visit the University of Michigan and check out the local hangouts. We've decided to do the same in Columbus. I've never visited The Ohio State University. I received several lessons to review this week for the Basics class. Looks like things are back to normal! I also heard from two of my students in the Swatch to Sweater class. Both have started knitting. I am really enjoying working with the students on their designs. I have put it off as long as possible but I think I have to delve into the dark and murky world of decreases. I've reviewed a few lessons for the Basics class and a Masters Level 1 submission where there was some confusion over decreases. The discussion of decreases is much more complicated than for increases so I will break this into several weeks. When you talk about decreases you have to discuss the mechanics of making the increases, how to make the increases look better, where to place the increases, mirroring and twisted vs. untwisted decreases. This week I will begin with mirroring and K2tog decreases. Where do you use decreases? Sometimes you evenly space them at the bottom of a sweater or at the top of a hat. In those cases it really doesn't matter which decrease you use. The direction of the slant isn't all that important. You use decreases in lace but lace patterns are very specific about the types of decreases to use as the slant and type define the lace pattern. 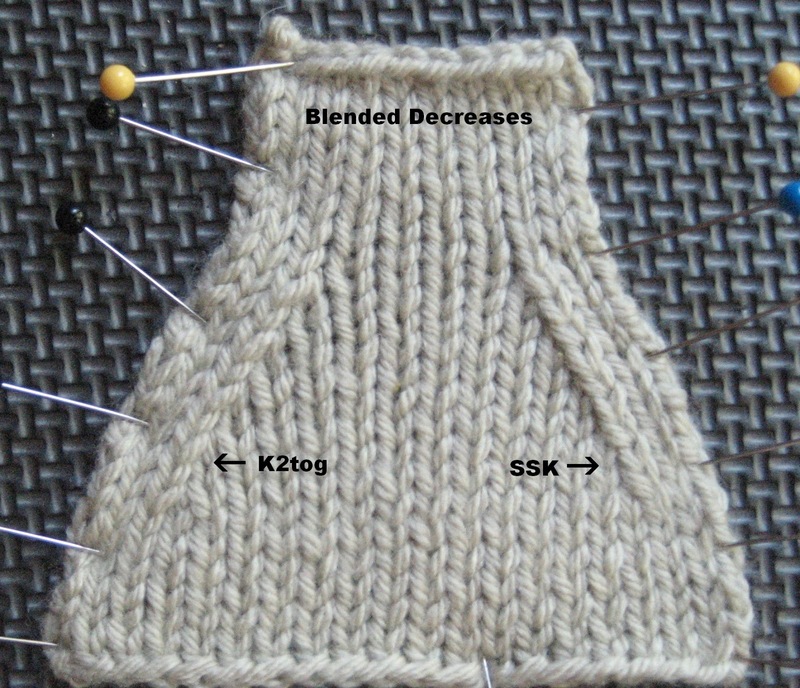 When determining which decreases to use is important is when decreases are used to shape armholes or a neckline of a garment. 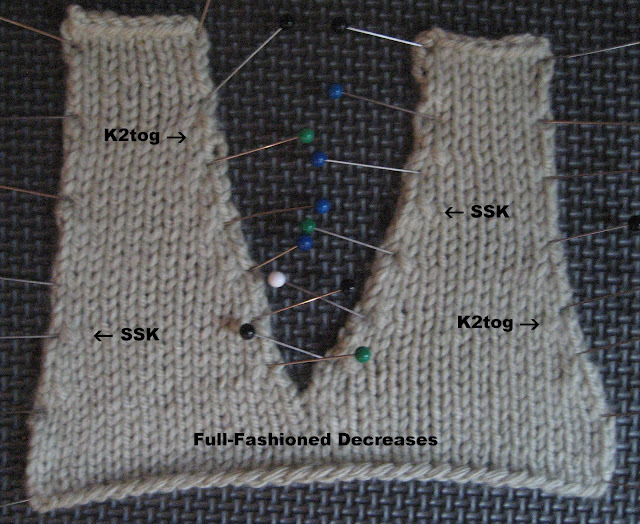 Most patterns do not specify which decreases to use and leave it up to the individual knitter. In these cases, the placement of the decreases and the slant of the decreases should be mirror images of each other. This makes the garment symmetrical. The human eye expects symmetry and when something is asymmetrical, it draws the eye (and not in a good way). You know something is not quite right. Non-mirrored decreases is something that can make a garment look "homemade" rather than "handmade." The photo below shows K2tog decreases worked on both sides of the swatch. K2tog decreases slant towards the RIGHT (/). 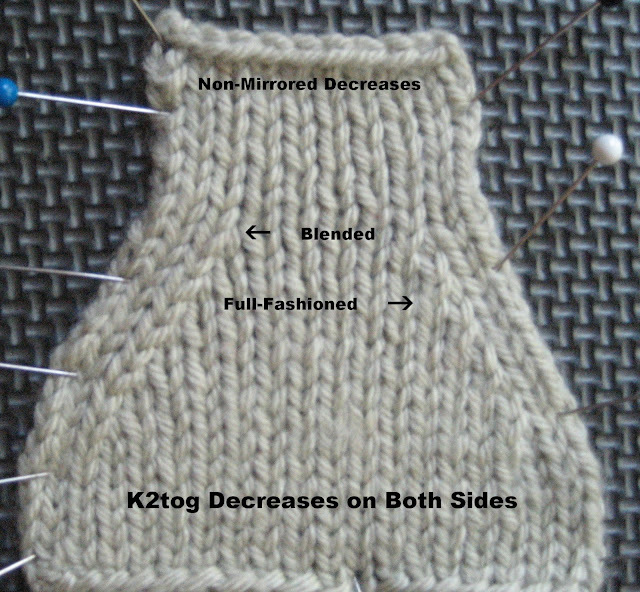 When K2tog decreases are placed on the left side of a piece, the stitches to the right are "tucked under" the decrease. In the Masters program we call this placement "Blended" which means that the decreases slants in the SAME direction as the slant of the piece. When they are placed on the right side of a piece, they "abut" the stitches to the right. In the Masters program we call this placement "Full-Fashioned" which means that the decreases slants in the OPPOSITE direction to the slant of the piece. Initially, it make look like this is symmetrical as the piece decreases on each side and they are the same size but when you look closely or stand back a bit, you can see that it is not symmetrical. There appear to be two stitches on the right side before the decrease but three stitches on the left. 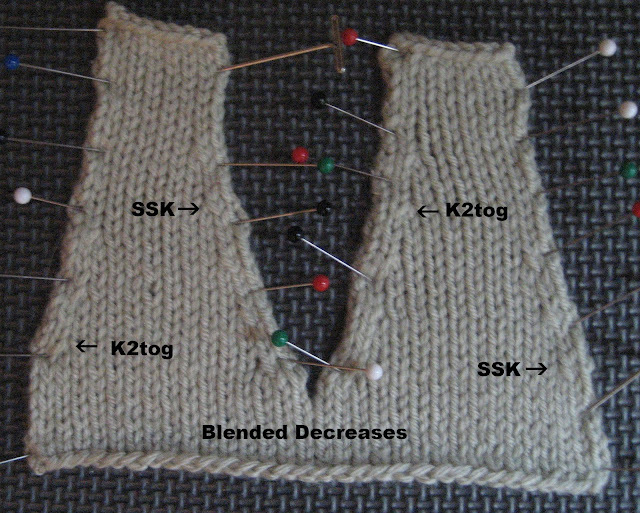 In the photograph below, K2tog decreases are worked on the left side of the piece and SSK decreases are worked on the right. Notice that the stitches on both sides are "tucked under" the decreases and there are three stitches on both sides. SSK decreases slant towards the LEFT (\). One of the difficulties in mirroring decreases is that SSK decreases tend to be larger than K2tog decreases. SSK decreases will be discussed in future weeks. The two photographs that follow show simulated "V"-necklines where decreases are used to shape armholes and the neckline. The types of decreases used at both sides are labeled. Does it really matter which placement you choose? For most projects, no. It is a matter of personal taste. For colorwork and some stitch patterns, full-fashioned placement works better as there is a clear definition between the body of the piece and the border. What is very important is that you are consistent. Don't mix and match different types of decreases on one side. The video for this week is about how to make K2tog decreases. These decreases are the easiest to make and you really can't go wrong. You simply knit two stitches together. The video for this week shows this process. K2tog Decreases. In the upcoming weeks, I will discuss the different types of decreases (SSK, SKP, KSP) and the various ways to make them and ways to improve their appearance. I will also discuss twisted decreases. Salon this week will be on Saturday. I'm going to be traveling a bit this month on weekends so I will have to cancel several times. I worked up some swatches for my proposals with mini pleats. Pleats aren't hard but require upfront planning. The last thing you want to do is to discover that you miscalculated when you are at the top of the pleat. The major disadvantages of pleats are that the fabric is double which can make it bulky and requires a ton of knitting. 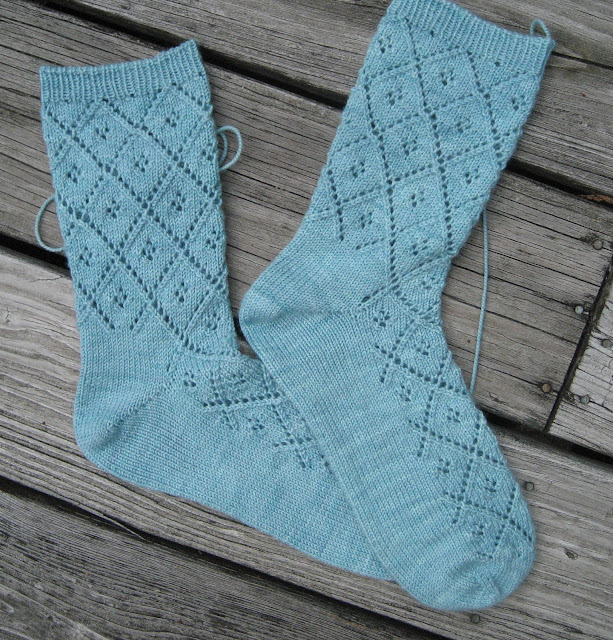 I finished up the Breakfast at Tiffany's socks. I have proposed doing the pattern for Cast On as they demonstrate very well the problems of knitting certain patterns in the round. 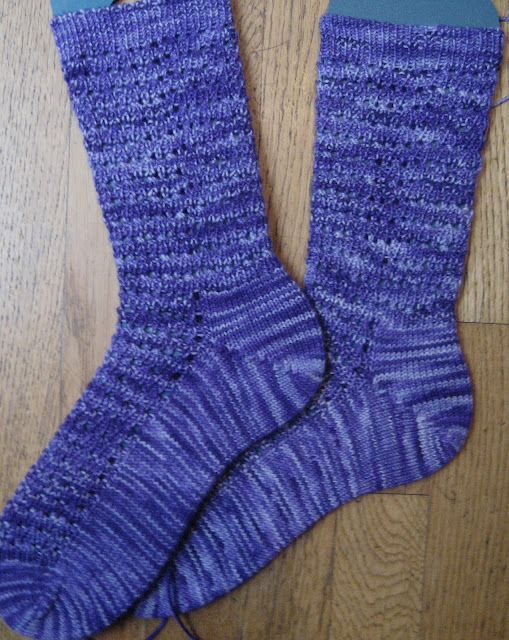 When I finished up these I started on another birthday pair which taught me some valuable lessons which I already know. I just didn't pay attention. I used a variegated yarn which I try to avoid. It is so hard to work with variegated yarns. The pooling problem I can deal with. The fact that you can't see ANY stitch is another issue. If anyone sees me at a show with variegated yarn in my hands, do me a favor and take it away. I tried out 3 different patterns. Naturally I didn't knit a gauge swatch to test it out. 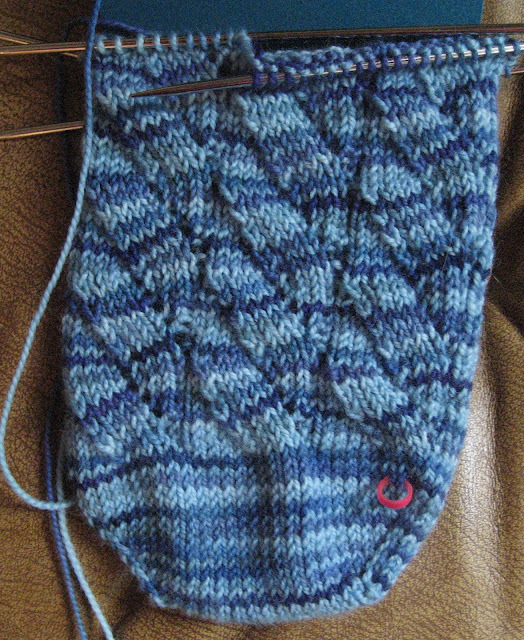 I knit the socks up to the heel to decide I didn't like it. I'm not thrilled with the stitch pattern I chose (not that you can see it anyway) but it does reduce the striping and pooling. This isn't really the color of the socks. The purple has more red in it. I am using Miss Babs' Yummy color Blue Ridge for the next pair of birthday socks. 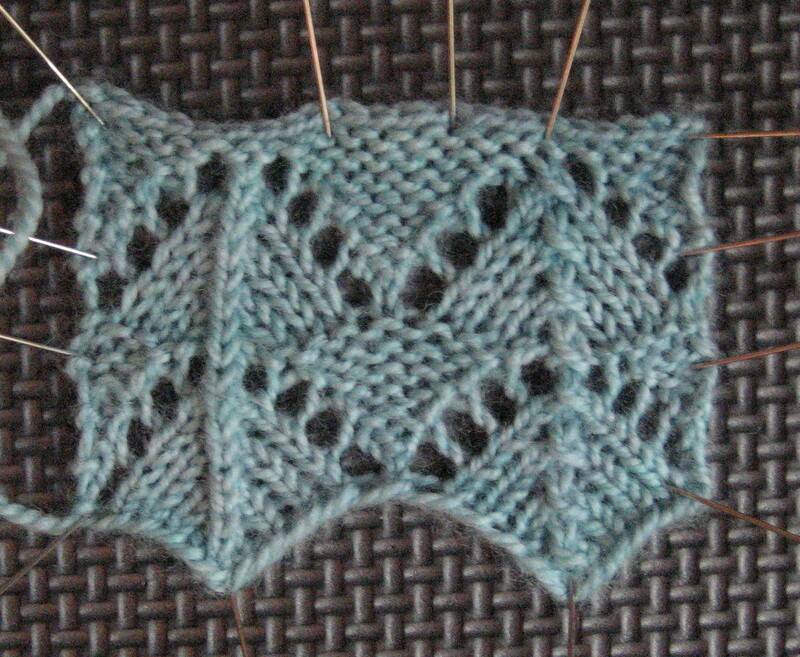 Although this is variegated as well, it is a lighter color and I have chosen a stitch pattern which works very well. The color again, isn't quite right. Check Miss Babs' website for a truer color. I am following my own advise for the next pair which will be a solid color. I did a swatch to check out the pattern. I am having so much fun with the Japanese stitch dictionaries. This would have worked well with the Blue Ridge as well. Stockinette and Reverse Stockinette next to each other work well for variegated yarns.